Dr Colin Harper is the Manager of Disability Action’s Centre of Human Rights. He has participated nationally and internationally on the ratification and implementation of the UN Convention on the Rights of Persons with Disabilities. He has lectured in political philosophy and held a research scholarship in ethics, human rights and mental health in the School of Medicine, Queens University Belfast. You can contact him at ColinHarper@disabilityaction.org or (+44) 028 9029 7880. 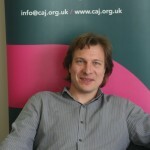 Daniel Holder is the Deputy Director of the Belfast-based human rights NGO CAJ. He previously worked in the policy team of the NI Human Rights Commission and for a number of migrant rights projects including heading the Animate project set up by the South Tyrone Empowerment Programme (STEP) and Dungannon Council. Prior to this he taught in the University of Havana and worked as a translator for press and media organisations in Havana, Cuba. He has an LLM in Human Rights law from Queen’s University Belfast. He can be reached on daniel@caj.org.uk. Hannah Russell is currently undertaking a PhD at Queen’s University, Belfast entitled the ‘Right to Life and European Conflicts’. 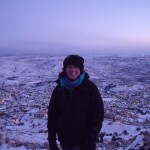 She has previously worked as a legal researcher for Al-Marsad – Arab Human Rights Centre in Golan Heights, Cambodian Centre for Human Rights, Disability Action’s Centre for Human Rights, Northern Ireland Human Rights Commission and Women’s Centre for Legal Aid and Counseling (Palestine). You can contact her at hrussell06@qub.ac.uk. Rory O’Connell is a Professor of Human Rights and Constitutional Law, Transitional Justice Institute / Law School, University of Ulster. He is author of Legal Theory in the Crucible of Constitutional Justice and a former collaborator on the QUB Project: Budget Analysis and the Advancement of Economic and Social Rights in Northern Ireland. Rory is a member of the Executive of CAJ, and sits on the editorial board of NICEM’s magazine Migrant Rights Now. You can contact him at r.oconnell@ulster.ac.uk or http://www.transitionaljustice.ulster.ac.uk/staff_profiles/r.oconnell.html.